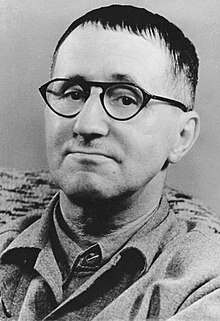 Eugen Bertolt Friedrich Brecht (German: [bʀɛçt]; 10 Februar 1898 – 14 August 1956) wis a German poet, playwricht, an theatre director o the 20t century. He made contreibutions tae dramaturgy an theatrical production, the latter throu the tours unnertaken bi the Berliner Ensemble – the post-war theatre company operatit bi Brecht an his wife, lang-time collaborator an actress Helene Weigel. ↑ The introduction o this airticle draws on the follaein soorces: Banham (1998, 129); Bürger (1984, 87–92); Jameson (1998, 43–58); Kolocotroni, Goldman an Taxidou (1998, 465–466); Williams (1993, 277–290); Wright (1989, 68–89; 113–137). This page wis last eeditit on 9 Apryle 2017, at 00:02.